PPL Aquatic, Fitness & Spa Group Inc. have been building and installing sauna's and steam rooms for over 30 years and have a wealth of experience on the proper design, operation and renovation of any of these amenities. These amenities are an excellent way to add value to your club and create a "spa" environment that will satisfy your members, guests or users. Infrared Saunas are fast becoming very popular for a variety of reasons including: the additional health benefits, lower cost of operation and maintenance, ease of set up and installation. PPL Fitness provides a range of infrared radiant heat saunas to accommodate a variety of budgets, space requirement and size. 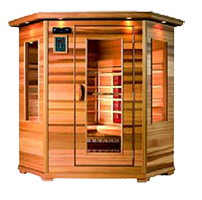 Infrared Saunas come in easy to assemble kits, pre‐fabricated units or custom designed units that are built in place. Because Far‐ Infrared Rays travel in a straight line, conventional Infrared heating elements cannot reach every part of your body. Infra‐Core's patented Far‐Infrared Heaters are coiled in a concave shape to allow for a much more concentrated range. 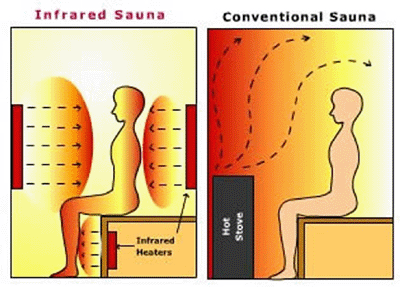 In addition we use additional emitters to ensure a broader range of Far‐Infrared dispersion throughout the sauna. So no matter how you are positioned in a Infra‐Core Sauna, whether you are directly in front of a heater or not, your WHOLE BODY is effectively receiving the beneficial Far‐Infrared Rays. Infra‐Core Sauna's patented pure ceramic Far‐Infrared heaters are more effective at lower temperatures and LOWER WATTAGES because ceramic requires much less energy to heat than steel. Also our Rapid Air System enhances Far‐Infrared penetration and detoxification process by cooling emitters for an even greater concentration of Far‐Infrared. (Patent Pending). #304 Surgical Stainless Steel grills (felt coated grills may release gases). Commander Control panel with a safety shut‐off timer is standard on all models. After the preset cycle is complete, the heaters turn off automatically. For additional protection, Infra‐Core adds a protective grid which doubles as a backrest to shield your skin from the heater grills. Using cutting edge technology. Infra‐Core Heaters produce Far‐Infrared light like the sun's, but without harmful Ultraviolet Rays (UL) or Electromagnetic Field (ELF) radiation. Infra‐Core Heaters emit a very safe Gauss reading. Enhances Far Infrared penetration and detoxification process. (Patent Pending). Euro‐light exterior canopy with low voltage lighting. Far Infrared saunas which use pure ceramic concave shape emitters are backed by a long history, extensive medical research and results....Does the new technology? For a complete guide on how to construct your steam room, call PPL Group and ask for our construction department. PPL has designed, built and refurbished numerous steam rooms. Through proper design and allocation of responsibilities to specialists, such as tilers etc, your steam room will be a cost effective room. PPL Group provide a wide variety of Steam Generators to suite every project and after ensuring the design is right, space has been allocated, PPL can supply or supply and install the right generators and accessories to ensure you are code compliant and there is enough steam. With time, the underlying insulation and vapour barrier will either sag or become moisture laden, resulting in higher heating costs. Old sauna odours minimize sauna use and enjoyment. Older saunas do not usually comform to modern safety standards and could be a liability.